The past 24 months have seen the market flooded with crowd-funded drone campaigns, all followed eagerly by optimistic consumers willing to part with their money only to be let down by the end-result. Dobby looks different and early impressions are very positive. 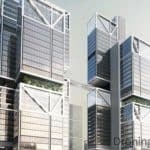 Manufactured in China by ZeroTech (established 2007), ‘Dobby’ features the unique selling points that we have been waiting for, these make it stand-out amongst optimistic recent competitors. 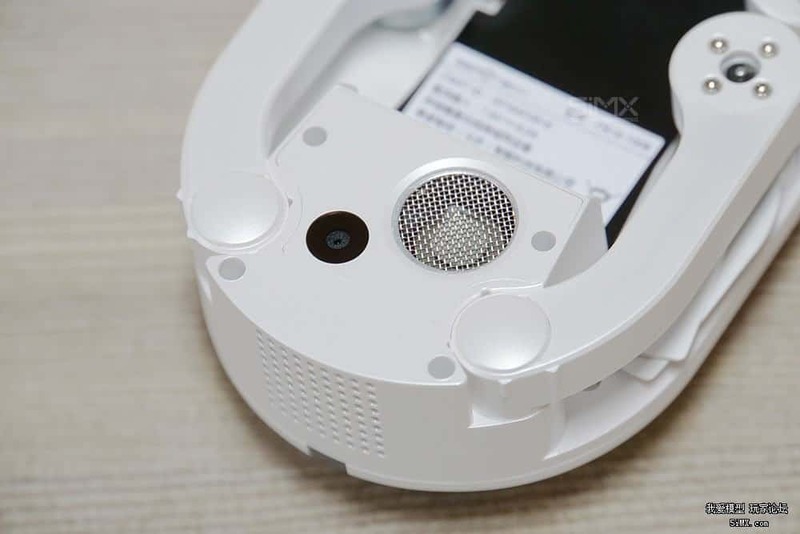 The product of a closed Chinese crowd-funding campaign which generated ￥16691443 (approximately $2.4m or £1.9m) via 10,000 backers, this new product is being shipped to backers now and will soon be available for purchase by regular buyers too. Unlike many of the recent drone ‘startups’, ZeroTech seem to have substantial funding, the launch show for Dobby was beyond impressive with demonstrations of Dobby drones flying clustered in sequence together. Dobby Drone by ZeroTech – demonstrating the folding motion of the props and arms. 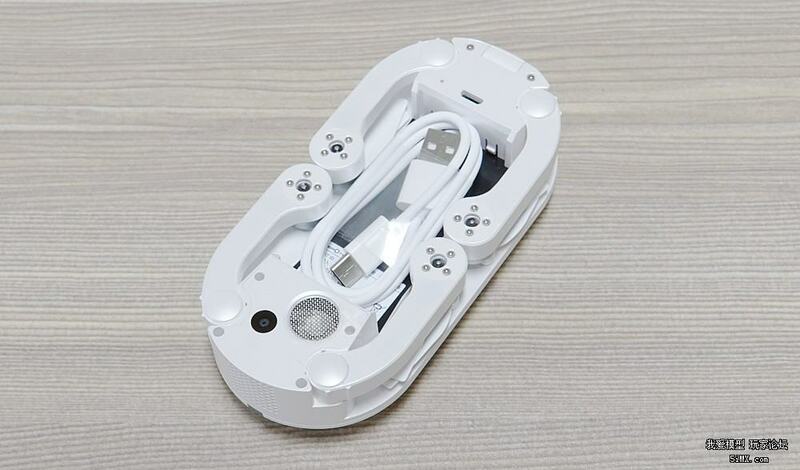 Dobby is foldable in two ways, not only do the propellers fold but the arms equipped with brushless motors also slide neatly and efficiently into the body of the quadcopter, allowing it to fit into your pocket (as per the above photo). Dobby Drone by ZeroTech – the motors of the Dobby together with foldable props. 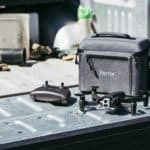 At this time, no other mini-drone can compete with this, this is true portability which also greatly reduces any potential for damage to your drone during transport. For the amateur pilots amongst us, prop-guards are also available and can be easily fitted. More information and pricing is needed in terms of replacement costs for these folding parts, as they will no doubt be the first elements to break during a crash. Dobby Drone by ZeroTech – demonstrating the compact size of this impressive new drone. Once folded, it’s size reduces to an impressive 135mm (L) x 67mm (W) x 36.8mm (D) with its width increasing to 145mm once the arms have been expanded. Weighing in at only 199g, Dobby is about the same weight as an iPhone 6+ and so taking it on a trip, ride or even a run isn’t going to slow you down. Next we consider the feature specification and this is where we are seriously impressed and excited, particularly considering the size, weight and compactness of this micro-drone. Boasting a 13mp camera (1 / 3.06 inches CMOS lens), Dobby is able to capture photos at 4K resolution (4208×3120) via a set of four different modes, ‘Single’, ‘Burst’, ‘Delay’ or ‘Beauty Shot’, sadly however it can only capture video at 1080p but maybe this resolution will be increased via firmware updates. 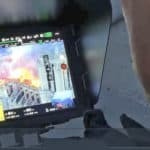 However early videos from actual end-users have suggested that stabilisation has not at this time been implemented into the actual device, this is a concern. 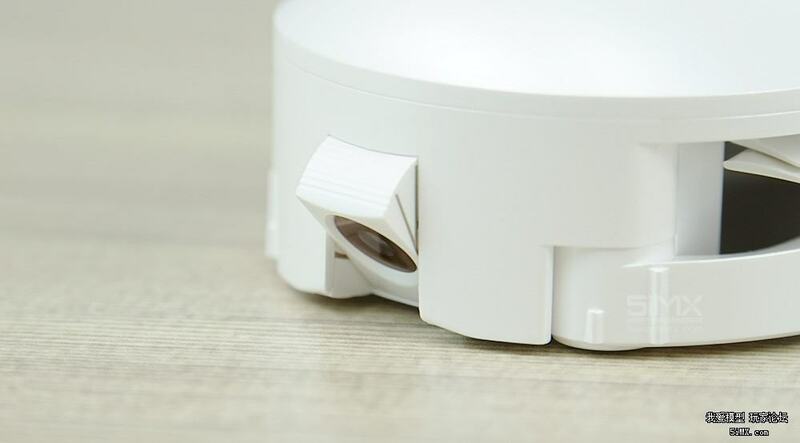 One simple but effective feature is the ability to tilt the camera angle, users were frustrated with OnagoFly in the regard that the angle couldn’t be adjusted. In this case, the camera can be tilted between -90° and 22.5°. 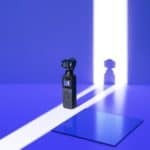 Dobby Drone by ZeroTech – the unique tiltable camera, solving the issue of many compact drones where the camera angle is fixed. Perhaps the most popular feature of recent drones is the ability for it to track or follow an object or person and Dobby can apparently deliver in this respect too. It features ‘face-recognition’ and ‘body-tracking’ which will allow it to follow you around, either indoors or out. Dobby Drone by ZeroTech – the optical flow tracking and sonar sensors on the underside. But more impressive is that on its underside, there is an optical flow camera and a sonar sensor which will allow it to maintain accurate hovering indoors (and out) by tracking the ground whilst also being aware of objects below. Mini-drones equipped with regular GPS to provide position-aware flight are becoming common-place, such as the recent HubSan 502S, however ZeroTech takes this one step further by equipping Dobby not only with GPS but also GLONASS, the Russian satellite positioning service also used by high-end drones such as the Phantom 4, therefore allowing dual-positioning to improve accuracy. Dobby is rated to by able to fly in a maximum wind strength of ‘4’ which according to most scales equates to 13-18mph, a moderate breeze. Considering the weight and size of Dobby, it is hard to believe that this is realistic and the likelihood is that if flown in such winds, the output from Dobby in terms of video/photo would most likely be unusable. There is concern however that the tracking features are not available immediately and must be ‘unlocked’ by clocking up hours of flight with Dobby, it has also been suggested that this is because Dobby does not yet have this functionality and that it is still under development. Dobby sadly lacks ‘transmitter’ control and instead can only be managed by mobile devices. This sadly limits its controllable range to approximately 50-100m although the real-world range is influenced by many factors such as weather, KP-index, terrain and smart-device make/model, a range-extender could be used to gain additional range. We hope that ZeroTech will eventually extend the firmware to allow the binding of 2.4ghz transmitters for advanced users. Dobby Drone by ZeroTech – the underside of the impressively folded drone. Details on whether or not Dobby features a ‘return to home’ or failsafe options in the event of losing connection are unknown but for safety we would hope that it does. Unlike other recent WiFi controlled drones, Dobby supports 5Ghz WiFi which provides far greater bandwidth, faster transmission speeds as well as better range. It is likely that the option used depends on the connectivity bandwidth and quality available at the time, or is perhaps selectable by the user. The latency of the streamed footage is quoted at 160ms which should be acceptable for FPV control. 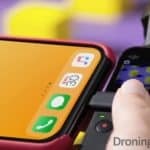 The app provides ‘gesture control’ by tilting the device but in addition the cameras are used to capture gestures made via your hands although we suspect that this will be rather unpredictable and so hopefully there will be an option to disable it. In addition, ‘voice control’ is mentioned allowing you to take off or even land by speaking into the microphone of your smart device, you can even ‘pat’ Dobby on its upper-side to instruct it to take-off, quite a gimmick. A frustration for many users of micro-drones is the battery life but here lies a vicious circle in relation to weight, flight-time and battery capacity. Dobby provides a fair compromise by offering a premium-looking removable 970mah 2-cell battery which delivers around 7-8 minutes of flight time. Flight-time is quoted as 9 minutes by ZeroTech but early reviews have found this to be over-optimistic. Dobby Drone by ZeroTech – the 970mah 2-cell removable battery powering the Dobby. 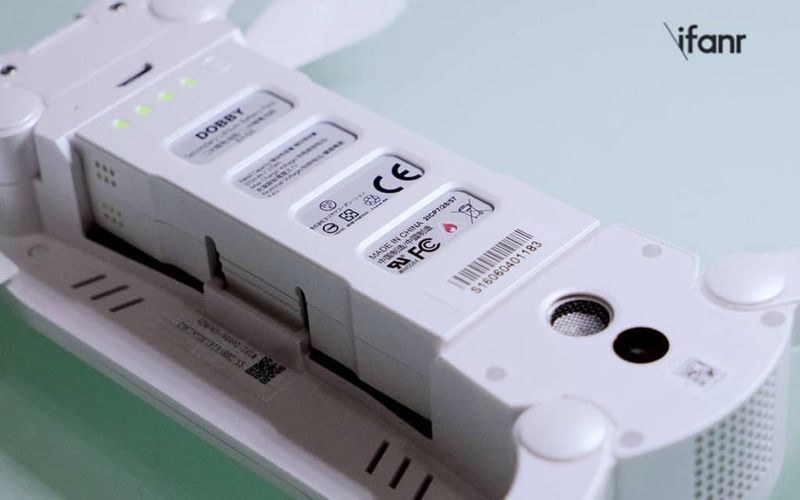 Being removable, you can purchase additional batteries which can be swapped whilst out and about, but an added bonus is that the batteries are chargeable via USB power-banks and therefore within only 30 minutes for a full-charge, you can be back up and flying again in a very short time. As discussed above, modes such as ‘Follow Me’ and ‘Face-Tracking’ are bundled into the firmware of this small autonomous drone, but in addition ZeroTech state that flight-path planning is also available with features such as ‘Automatic Trajectory Shooting’ mentioned. Dobby is also capable of ‘stunts’ such as ‘loop the loop’ and more but no additional detail is available concerning additional moves, or whether there can be any manual input involved. Dobby is the first mini-drone to excite people for some time, it is very early days but this is not a crowd-funded project, it is a new product from a manufacturer that have been creating large-scale quadcopters for some time, therefore they personally have invested the money for research, design and production with no dependency on public-generated funds or pre-orders. 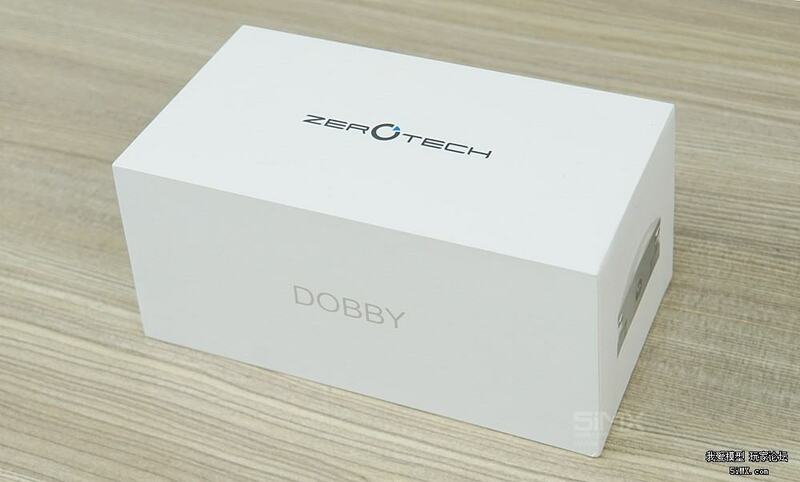 Dobby Drone by ZeroTech – the impressive and ‘Apple’ inspired packaging. It has innovative and unique features, specifically its portability with its folding arms and props. The build quality looks to be impressive and every consideration seems to have been met in terms of what consumers are looking for, such as the removable battery, ease of use and plenty of autonomy with its sonar, optical-flow and dual-GPS technologies. Dobby Drone by ZeroTech – the first compact drone to truly fit into your pocket! And the future may be interesting for Dobby too with rumours that it allows objects to be carried underneath it, the scope of which we are not aware at this time. However there are concerns that features promised are not yet integral to this device such as stabilisation and tracking, only when these features are available and tested will the viability of Dobby be truly known. Dobby is listed now on BangGood for around $350 (£270) but they’re still awaiting stock and so orders cannot be placed at this time. At this price, Dobby equates to extremely good value if it can deliver on all of the functionality above, and that remains to be seen. Join the discussion now via the DroningON Discussion Group and be sure to visit us on Twitter, Facebook and Instagram!